What should I say? How do I start? Where am I to turn? Everywhere there is grief. Everywhere reigns anxiety and fear. I wish I was never born, or at least have been fortunate to die before this time. How will future generations be able to believe that once, there was a time when all people were dead, when the earth was without residents? When the terrible and infinite solitude prevailed? The merchant ships that sailed from Oslo to ports in Southeast England is this time to return home with something quite other than the usual cargo of wheat, glassware, beer and wine; the crew tells stories about a plague so terrible that no one will ever live to hear about its equal. At this time, the norwegian population consists of approximately 350 000 inhabitants. During a two year period, 220 000 of these will perish in a way that shall create a overwhelming anguish that is to torment the minds of men in the centuries that is to follow. In Sweden it was called digerdöden, in England The Great Mortality, in Spain gran mortaldad, and in Norway storemannedouen - it was the great plague of men. Aching, stinging boils in the armpits, groin and neck, lung fire and ominous blue and purple spots appearing on the skin were some of the torments. "The spots are numbered" was the saying in Norway, which meant that time was running out. When the spots appeared, all hope was lost. Among the population, panic gradually grew stronger; to protect themselves against the terrifying plague, families and sometimes whole villages fled to the forest, to the mountain or other isolated locations. The stories exists about families who left their dying relatives behind, about priests who did not dare to hear the last confessions - the sick were left entirely to themselves, to draw their last breath in fear and in solitude, secluded and deprived of any form of human dignity. While historical documents can tell us much about past events, historical legends can tell us something about people's way of processing these events. The morbid nature of the plague is reflected strongly in the folklore, and provides us with a good insight into how ordinary people experienced this sinister historical event. 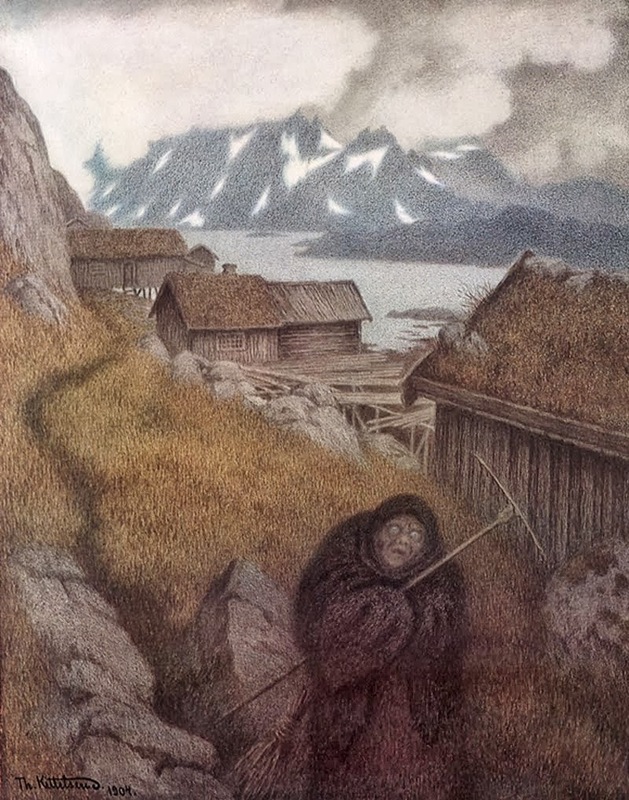 In Norwegian legends, the most know creature connected to the plague is the old hag named Pesta, carrying with her disease and death. She is not a witch, although people believed that witches could cause illness through sorcery. Even though the witch casted her spells on her neighbors and caused disturbance and damage through her black magic, she was still part of the local community. The only time she left was when she were to participate in the witches' sabbath, wether it was at Lyderhorn in Norway, Blåkulla in Sweden, Blocksberg in Germany or Hekla in Iceland. Pesta however, lives nowhere. She is constantly on the move, and she is never personally known to her victims. She is a mythical creature, not of this world, yet she is not a familiar element in the nature and in nightlife like trolls, goblins and dwarves - she is special, unique in all her malice. "It is significant that, besides satan, the normal cast of characters, trolls, nisser, tomtar, rån, etc., was not called on to explain plague. This indicates the immense, overwhelming force of the plague in rural Scandinavia and elsewhere in Europe: plague was so overpowering and so far outside the sphere of normal human experience that it simply had to come from outside the traditional cast of characters." There are various descriptions of Pesta, though there are some characteristics that often recurs. Two of them is her rake and broom - were she used her rake, some were left lucky enough to live. Were she used her broom, people were killed by the thousands. She also uses a red skirt, which according to the folklore is a magical color, associated with witchcraft and the supernatural. A witch could for instance cause harm by throwing a curse so that the cows of her enemies would milk dark red blood. Ghosts resurrected from hell could also be dressed in red. Black, which was also used to describe the old hag, is commonly known to be connected with grief, death and funerals. 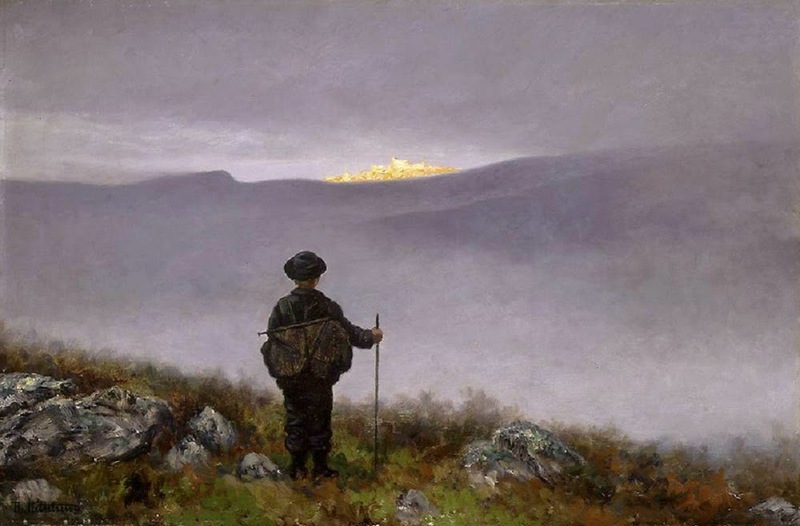 The famous Norwegian artist Theodor Kittelsen has perhaps created the spookiest, most defining image of Pesta. 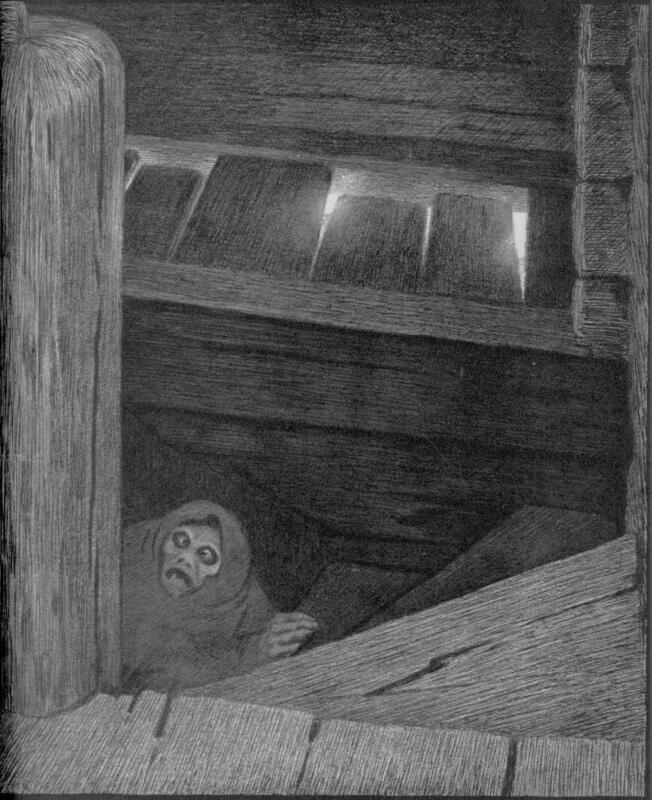 For many norwegians, his drawings remains to this day the most evocative visualization of the plague and its horror. Pesta i trappen ("Pesta in the stairs") is perhaps his most famous drawing of the old hag. Here we find ourselves at the top of the stairs in an old medieval timber house. The daylight seeps in through open cracks in the wood, in contrast to the immersive feeling of dread we are exposed to inside. Pesta creeps and crawls up the stairs with her pitch-dark eyes and scrawny hands, cloaked in the darkness that surrounds her. The perspective is placed fairly low, which makes the scene even more sinister - it is as if we are facing this dread through the eyes of a small child. We become so small and defenseless, and suddenly we know all too well, that there can be no escape. "They hide themselves in caves and canyons, chasing each other as wild animals. 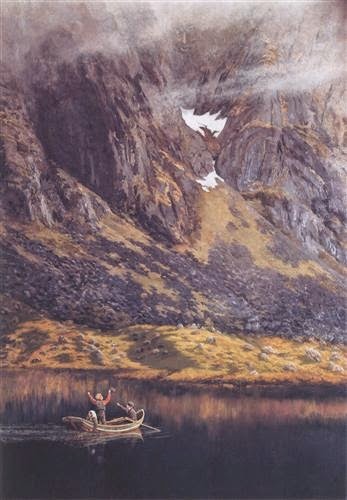 Pesta finds them, tracks them down," Kittelsen wrote. Man is left entirely to himself, without the possibility to mislead Pesta on her journey. And even still, there is also human aspects of her; her job is to exterminate mankind. She is like a ghost, without rest, without sleep. In another of Kittelsens drawings, we find a tired and feverish figure on her journey of searching for new places to exterminate - the toil and effort from the burden she carries is weighing her down. Staring, almost in desperation, she leaves another village behind her. Over the mountains the fog creeps in on little cat feet, like a blanket to cover all places where life used to exist. Through this drawing, Kittelsen is able to both visualize the disease itself, as well as the isolation and agony inflicted on so many countless souls. At the same time, he manages to make this pitch-black figure into a human being. For she too is a victim, doomed to roam the earth forever, with her rake and her broom.